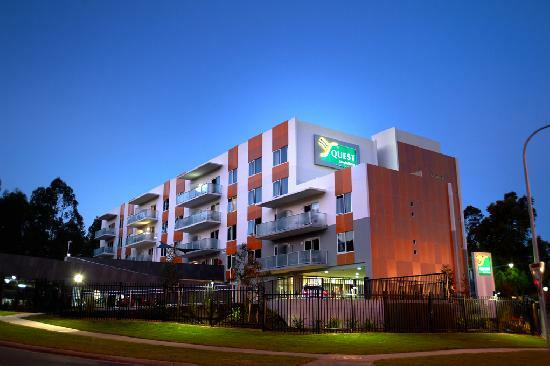 Quest Campbelltown is the newest serviced apartment accommodation in the area offering brand new, modern and stylish 4.5 star Serviced Apartment Accommodation to the corporate, conference, extended stay or leisure traveller. Quest Campbelltown Serviced Apartments offers a range of studio, one, two and three bedroom serviced apartments - ideal for a short or long stay, quality accommodation in South-West Sydney, providing easy access to the M5 and a host of nearby Business Parks including Campbelltown, Prestons, Minto, Ingleburn, Moorebank, Eastern Creek and Smeaton Grange. All types of travellers can take advantage of the discount accommodation at the Quest Campbelltown, as well as the range of modern amenities including business centre, conference centre, direct internet access, disabled facilities, faxing facilities, free car parking, guest laundry, gym & fitness equipment, lift, room service, bbq, baby cots available, babysitting service, daily housekeeping and express check in/out. To accommodate your professional needs, each apartment provides guests with wireless broadband and dedicated direct dial telephone lines for fax/modem access. Further services include conference/meeting facilities, secretarial services, facsimile, photocopying and computer printing services. Quest Campbelltown Serviced Apartments Accommodation, Sydney – affordable, quality, serviced apartment accommodation in south west Sydney, ideal for holiday makers and corporate business travellers. Nearby Attractions : Quest Campbelltown is located in the Macarthur region, south west of Sydney. Campbelltown is a vibrant and growing region filled with many experiences from adventurous activities, action packed sports, exceptional historical sites, spectacular natural wonders and an array of quality dining experiences. Filled with scenic bush land surrounds, historical charms, wineries, retail therapy and modern delights. Campbelltown offers something special for everyone including The Campelltown Arts Centre which is a state-of-the-art facility delivering a broad range of contemporary cultural programs in both the visual and performing arts. The Japanese Gardens and Teahouse is a relaxing and tranquil experience within a traditional Japanese setting. The CUBE Campbelltown Convention and Entertainment Centre offers a state-of-art entertainment, conference and function venue. Enjoy your next meeting, conference or night out at The Cube. Mount Annan Botanic Garden is Australia's largest botanic gardens with more than 4000 species of native plants across 410 hectares. The Beer Shed is a small scale brewery where you have a hands on brewing experience in making your own beer. Choose from more than 200 styles of beer to suit your taste. 1 Bedroom King/Twin Apartment : Sleeps up to 3 guests on 1 King Bed Or 2 Single Beds + Sofa Bed Extra. 2 Bedroom 2 Bathroom Apartment : Sleeps up to 5 guests on 2 Kings/ 1 King & 2 Singles/4 Singles + Sofa Bed Extra. 3 Bedroom 2 Bathroom Apartment : Sleeps up to 7 guests on 3 Kings/2 Kings,2 Singles/1 King, 4 Singles/6 Singles + Sofa. Studio King/Twin Apartment : Sleeps up to 2 guests on 1 King Bed Or 2 Single Beds..